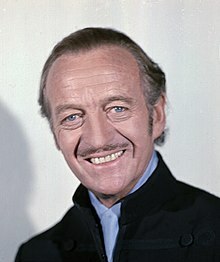 James David Graham Niven (1 March 1910 – 29 July 1983) was an English actor and novelist. His many roles included Squadron Leader Peter Carter in A Matter of Life and Death, Phileas Fogg in Around the World in 80 Days, and Sir Charles Lytton, ("the Phantom") in The Pink Panther. He won the Academy Award for Best Actor for his performance in Separate Tables (1958). Born in London, Niven attended Heatherdown Preparatory School and Stowe before gaining a place at the Royal Military College, Sandhurst. After Sandhurst, he joined the British Army and was gazetted a second lieutenant in the Highland Light Infantry. Having developed an interest in acting, he left the Highland Light Infantry, travelled to Hollywood, and had several minor roles in film. He first appeared as an extra in the British film There Goes the Bride (1932). From there, he hired an agent and had several small parts in films from 1933 to 1935, including a non-speaking part in MGM's Mutiny on the Bounty. This brought him to wider attention within the film industry and he was spotted by Samuel Goldwyn. Upon the outbreak of the Second World War, Niven returned to Britain and rejoined the army, being recommissioned as a lieutenant.